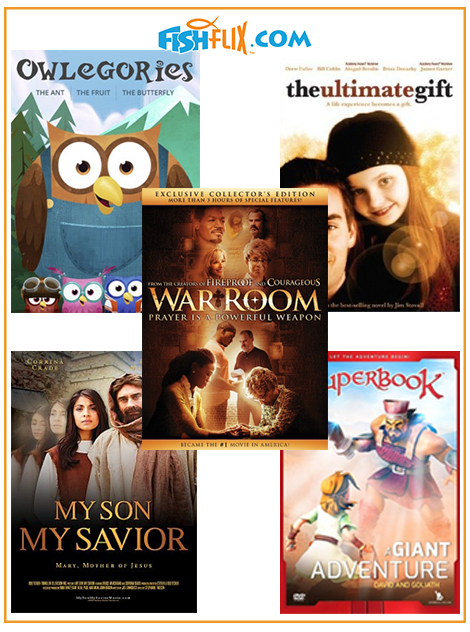 Our family adores books that relate the story of the birth of Jesus. This is a precious picture book about Jesus’ birth. Told in cumulative story form, all of the pieces of the story come together to tell us of the harsh conditions of the night that brought us the most precious gift in the world. Ever. This is the bed where Jesus slept. This is the straw that lined the bed where Jesus slept. These are the first two lines in the retelling of the birth of Jesus. From the bed in which Jesus was laid to the angels rejoicing in heaven to the visit and gift of the wise men, this story will delight readers of all ages. While we don’t know the exact time of year Jesus was born, this story reminds readers of the joyful event that we often celebrate in December at Christmas. The pages are beautifully illustrated with vivid colors and lovely images. These images bring the story to life. This book is written by Norma Lewis, who is the author of 10 books and lives in MI with her marmalade cat named Scalawag. She enjoys spending time with her six grandchildren. The book is beautifully illustrated by Katy Hudson. Where Jesus Slept brings joy to all who experience it. I get the privilege of sharing this beautiful books with one winner. Unfortunately, this giveaway is for US addresses only. One winner will be chosen from all entrants and notified by email. Giveaway will end at midnight on 11/16/16. Winner must respond by email within 48 hours of notification. Click the link below to be taken to the form for the giveaway. Yep. That is what Miss E wanted to be when she was four years old. And books are still some of her very best friends. But, to be a “writer down book-worder”, what do you need to do? What will help you on your way? Douglas Wilson, author of Wordsmithy: Hot Tips for the Writing Life, tell you just what will help you in this fascinating, funny, and filled book. Timberdoodle sent me Wordsmithy and asked me to review it. It was such a fun book to read. Non-fiction books don’t often get that moniker but this one deserves it. Whether you are a writer working on your hundredth book or a youngster who is wanting to be a “writer down book-worder”, Wordsmithy has a ton of encouragement and practical suggestions just for you. Broken down into 7 tips that each have 7 parts, Wilson has wasted no extra words just for the sake of it. Clear, clean, and concise, you will enjoy learning about how to learn about words. Beginning with knowing the world outside of books, Wilson encourages the hopeful author to “do”. Learn from the world around you and not just the different, exciting things but the day-to-day, as well. He encourages us to learn from books – all kinds of books, from the stuff you want to tell others about to the ones that you want to tell no one about. Read the real, the imagined, the boring, the exciting. Read the dictionaries (yes – he really said that and I totally agreed with his reasoning!) and books of quotations. Read and then read some more. From learning another language, even if you don’t master it, to writing down things that inspire or sound fun, the tips in Wordsmithy were a major encouragement for me. And I can see how they will be of great value to students, especially ones who enjoy words of all kinds. Timberdoodle has included this book in the 11th grade curriculum kit since it is such a good instruction book. If you have a student who enjoys sounds, words, and how they all work together, this is a book for them to read. I believe that I will be having Miss E, age 12, read it this fall. Creating a commonplace book (I didn’t even know what that was until reading this!) is now on my goals list. Simple, easy-to-incorporate ideas such as this make Wordsmithy a book that is worth your time to read and share with anyone who will have to do any writing. Even essay writers will benefit from the wisdom of Wordsmithy. Visit Timberdoodle to read an excerpt from the book or to get your copy of Wordsmithy. Timberdoodle has offered one copy of this book for a giveaway. This giveaway is open to US residents only. Please click the link below to enter the giveaway through Rafflecopter. The giveaway will end at midnight on 9/03/16 and the winner will be contacted through email. Sweet bedtime books are just about my favorites. Especially for newborns and infants. 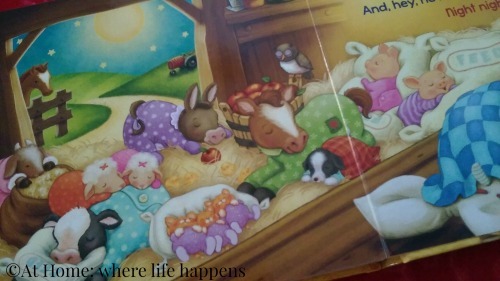 I was given Night Night Farm by Amy Parker, illustrated by Virginia Allyn to review for Flyby Promotions. This board book is just perfect for cuddling with your sweet little one as sleepytime approaches. 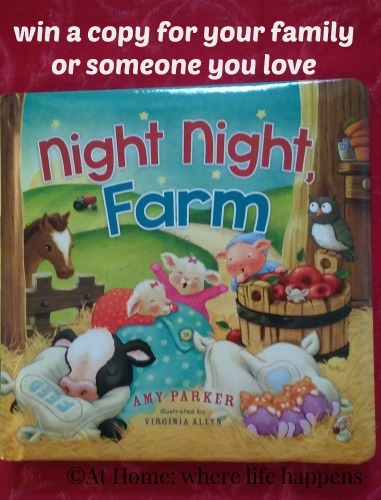 Featuring bright, vibrant images and cheerful, rhyming verse, Night Night Farm brings nighttime to the farm and to your home. With all the animals small children love – cows, pigs, horses, owls, cats, sheep and chickens – saying good night has never been more fun. 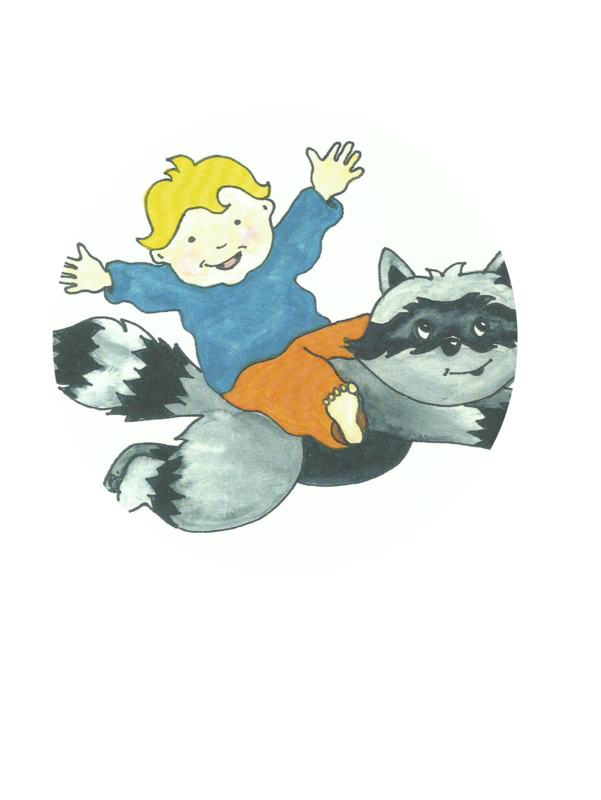 Your children will revel in the antics the animal babies go through on their way to bed. As the farm says “good night,” each animal prominently takes the time to say good night in their own special ways. From getting their baths (messy little pigs!) to a sweet lullaby (sung by mama cow) to snuggling down with daddy to watch over (as daddy owl does), the farm goes through the same bedtime routine each little boy or girl does. But my very favorite part is the last page where the reader, or listener, is reminded that God made not only these very special animals who each have their own special place on the farm but he made the special listener or reader as well. And it is important to say “good night” to God, too. I would definitely be happy giving this book as a gift to a family who is expecting a new baby sometime soon. 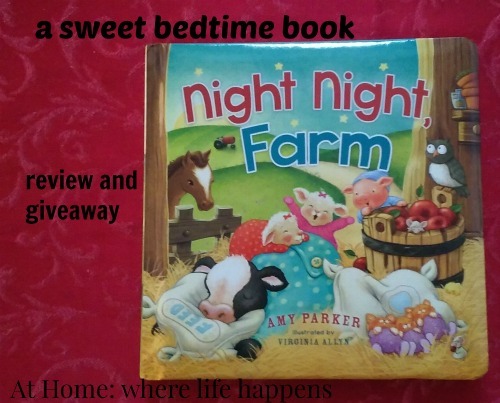 Vibrant, fun, and colorful, Night Night Farm by Amy Parker is a joy. Click below to be taken to the Rafflecopter form for this giveaway. FishFlix.com – I forgot their giveaway! So, when I wrote the review for The Gospel of John DVD from FishFlix.com, I forgot to include the giveaway that they have offered to the readers of the Review Crew blogs. It is a simple entry – just go sign up for their newsletter HERE. They are giving away $80 in videos just for signing up. You have about 3 weeks to do this but it is simple so go sign up right now! There are also ways you can get additional entries. Writing about this giveaway was not required as part of the review but who doesn’t want a chance to get some free movies when they are THIS good? So, I thought it deserved it’s own quick little post so that you, my readers, don’t miss out on this as you would have if I had just updated my post. So, please go enter by signing up for the newsletter offered by FishFlix.com. A couple of weeks ago, these two books from Family Christian landed in our mailbox for review. They have been thoroughly enjoyed by both of the older girls and myself. They are fun and adventurous without all the nonsense that is normally a part of junior high girl books – meaning all the boy stuff and crushes and gossip is missing. I love that! The books begin by introducing us to the Glimmer family. What a fun name! The Glimmer family has mom and dad and three girls: twins Mia and Maddie and their younger sister Lulu. The family travels the world to accompany her mother, a singer, to her concerts which Mr. Glimmer plays at. 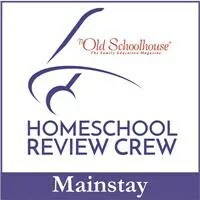 This provides amazing learning opportunities but also leads to tons of fun with Miss Julia, their fun-loving nanny. It also offers up lots of adventure and mysteries to solve. With the truth of God guiding the family and mom knowing that young girls need lots of love and encouragement, the family is able to find the clues and grow closer. 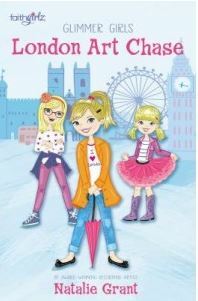 London Art Chase is the first book in the Glimmer Girls series. The family is in London for Mom’s concert and they get to visit some amazing sites. At the art museum, Maddie notices a strange behavior by a visitor and begins to formulate a mystery art theft in her head. Or is it all in her head? Chasing all over London to find clues and prevent the loss of famous pieces of art, Maddie, Mia, and Lulu find all sorts of interesting people and seeing all sorts of site. But the reality of making decisions becomes difficult. Can Maddie make the right ones and solve the mystery all on her own? Or should she call in her sisters and Miss Julia and her parents to help her? A Dolphin Wish is the second book in the Glimmer Girls series. This time, we find the Glimmer family in San Diego. With an extra day before the concert responsibilities begin, the family visits the local adventure park: Captain Swashbuckler’s Adventure Park. With all the animals they get to see, it is a fun and exciting place for Mia and her sisters. While visiting the dolphins and wishing hard she could swim with them, Mia overhears tidbits of a conversation between volunteers at the park about animals out of their habitats. This is just the challenge that Mia is looking for, hoping to be more confident and find a way to connect more with Maddie. The relationship had been strained since the art mystery in London. Can Mia find clues or is she reading more into what she overheard than is actually going on? Are the animals, including her favorites-the dolphins, in danger and can she save them? 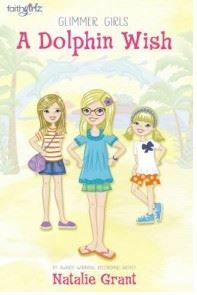 The Glimmer Girls series by Faithgirlz and ZonderKidz is a fun new series for pre-teen and young teen girls. The focus is really more on the adventure, though some Christian values and perspectives are included. It is a clean, fun series that my 9 and 11 year old girls really enjoyed. Mystery surrounding art and animals? Both are fun and we will be keeping our eyes open for more of these as they come out. 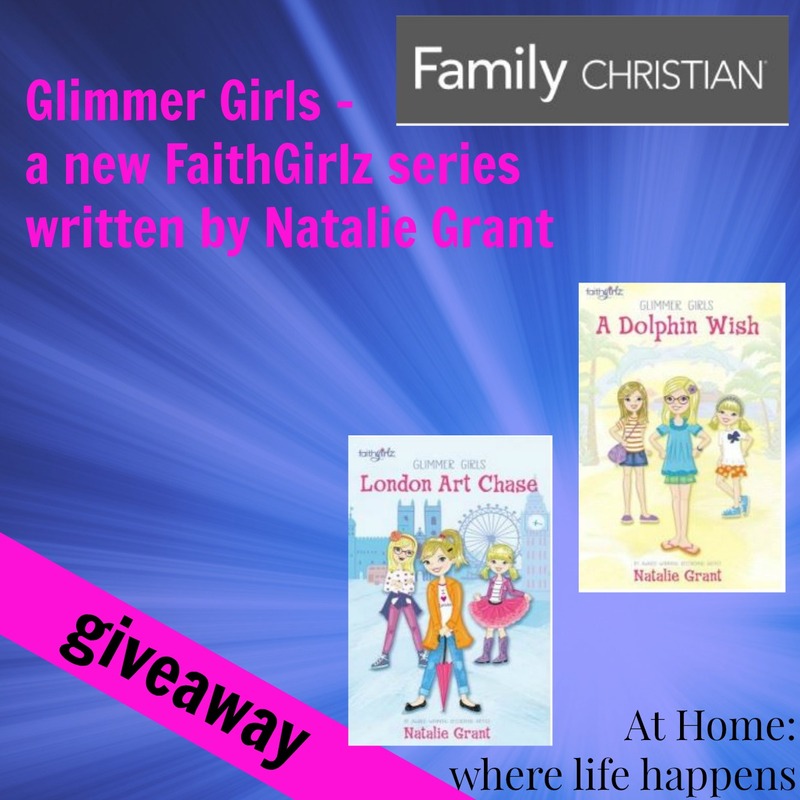 Family Christian will send one winner a copy of BOTH of the Glimmer Girls books in this review. It is open to US residents only. Ends 2/19/16. Click the link below to be taken to the giveaway entry form. Thanks for reading and entering the giveaway. My children are enthralled with rhyme. I think most children are. 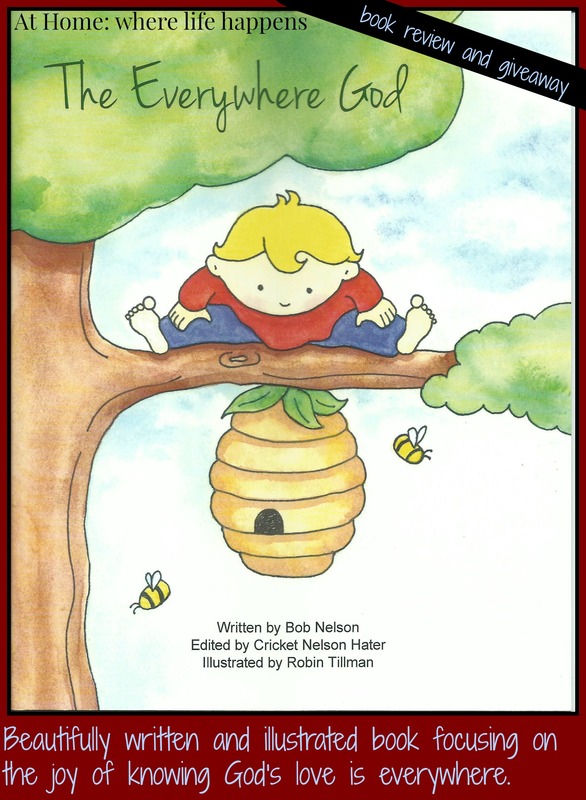 The Everywhere God by Bob Nelson and edited by Cricket Nelson Hater employs the joy children find in rhyme and word play to impress upon the hearts and minds of the children that God is everywhere, all the time, and that He Loves Them. I love simple children’s books and illustrations that help my girls learn and remember the precious gift that we are given through God’s love. In The Everywhere God I see such a joy in God’s love that I just want to share it! The rhymes bring out spontaneous laughter and sighs of understanding. The poem shows the love of God whether a child is happy and joyous, exploring the world, or feeling somewhat blue. Covering all aspects of our lives in ways children can grasp, this book is a work of art. The illustrations by Robin Tillman are bright, cheerful, and do a wonderful job of enhancing the poetry. I feel so blessed that Cricket Nelson Hater chose to share this wonderful poem with the world. Written by Bob Nelson for his granddaughter, we see his believe in the unending love of God and his great desire for others, especially his granddaughter, to see it, too. With surprising child-like faith, this joyous book brings God’s love into the heart, mind, and life of children of all ages. This is a book that I am delighted to have in our home. 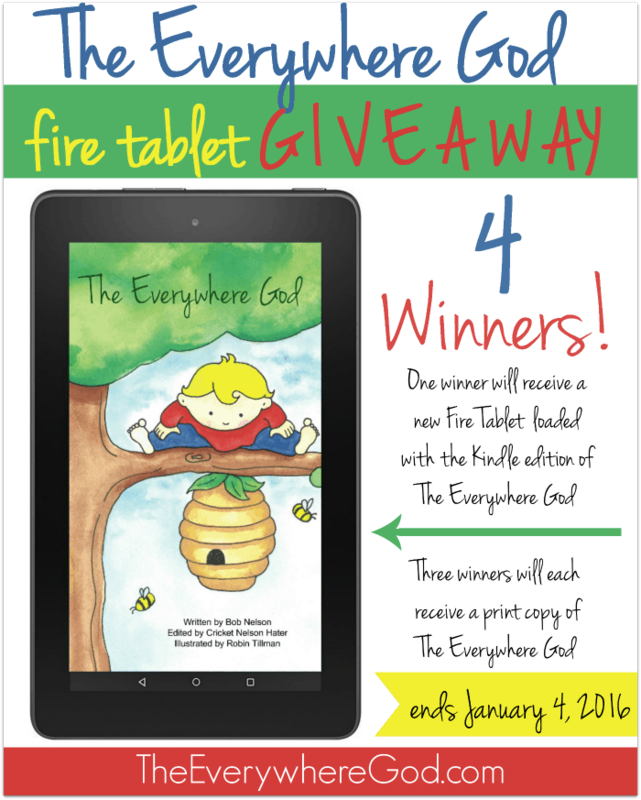 Three more winners will each win a print copy of The Everywhere God. The Everywhere God is a book about hope for children of all ages. 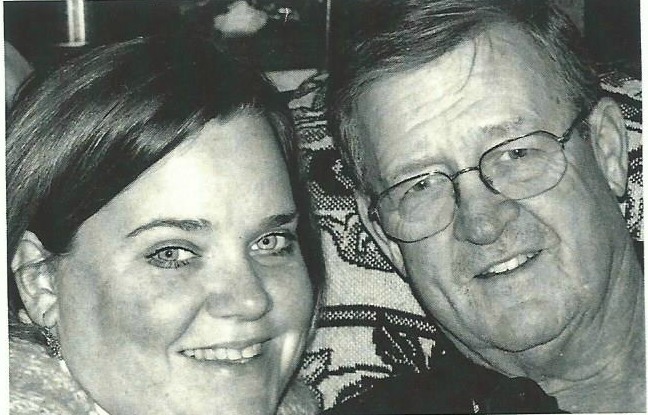 Written for his young granddaughter during a particularly difficult time, the late Pastor Bob Nelson wanted to be sure she knew God was with her no matter what else was happening. Despite people and circumstances, his message is clear, God never leaves or forgets about us and His love never ends. Upon it’s completion, he knew it was something special and wanted to make it a children’s book. Unfortunately, time passed and things never fell into place for his vision to come to life. He passed away in 2008 before he could see it happen. More than 20 years after it’s original writing, Bob Nelson’s daughter remembered this treasured poem and like her father, felt it needed to be shared with the world. For many years she kept this special story in the back of her heart and always dreamed of making his vision for a children’s book a reality. To enter the giveaway, please use the Rafflecopter below after reading the terms and conditions. Click on the link to be take to the giveaway form. This giveaway is open to U.S. residents only. Void where prohibited by law. Must be at least 18 years of age. This giveaway is in no away associated with Facebook, Twitter, Instagram, or Pinterest. No purchase necessary for entry. Odds are determined by the number of entries. Selected winners will have 48 hours to respond to email notification to claim their prizes or another winner will be drawn. Entry into this giveaway will subscribe you to The Everywhere God email list. Close your eyes. No wait – if you close your eyes you won’t know what I want you to imagine so scratch that. Just think about something. What is the first thing that comes to mind? For me, it is always the water that inevitably spills and the covering of the tables that needs happen prior to starting. Those are the two biggest issues for me with painting and allowing the girls free reign with the paints. Kwik Stix has fixed this for me. Well, to some extent. I do still put something underneath the page in case the pictures goes over the edges of the paper but there is no water needed! Seriously. 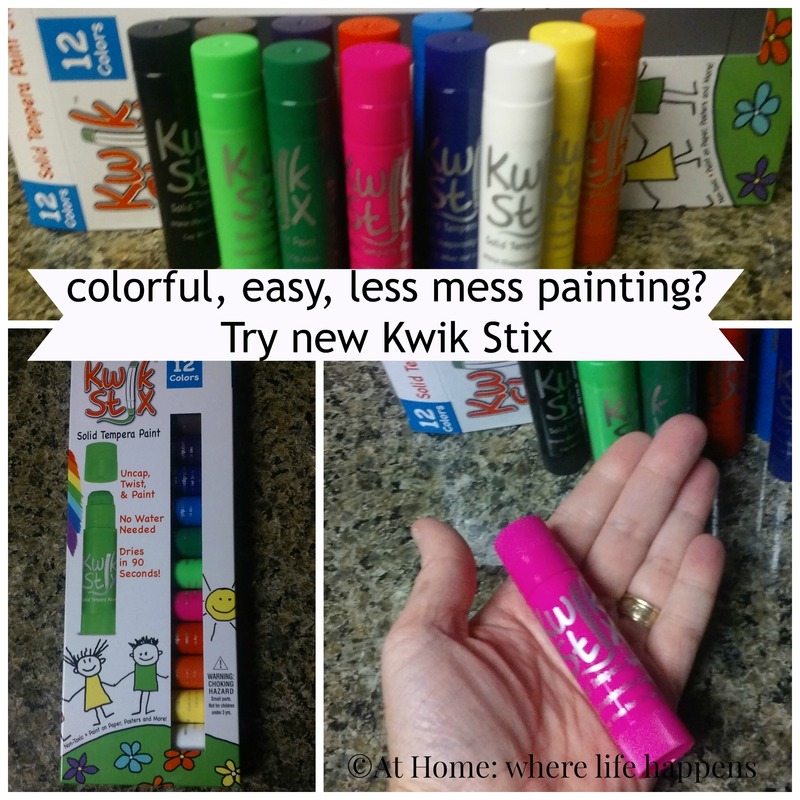 Kwik Stix is tempera paint in stick form. It is bright, vibrant colors. It is easy to use and has a quick dry time. Roll up just a little bit, use it, and roll it back down. Click the top closed and it is ready for next time. That is the extent of the clean-up, too. Make sure they are all closed and put them away. It really does make painting easier. And, Miss J (age 6) really enjoyed using the paints. Kwik Stix was a fun activity for the rainy afternoon on Thanksgiving when the girls couldn’t go outside and run off all the cherry pie and chocolate pie. Miss J must have been thinking about desserts still because she created a big pink birthday cake. Requiring so little prep and clean up, this paint can be pulled out often. Need a short activity? Put the Kwik Stix out. Kwik Stix are made by The Pencil Grip, Inc. They are solid tempera paint. They are easy to use for even very young children and they require little to no preparation or clean up. They are fast drying. They are a fantastic preschool and lower elementary age product. There is even some really good application to upper elementary ages. One project we did included making a background for a nutcracker project. 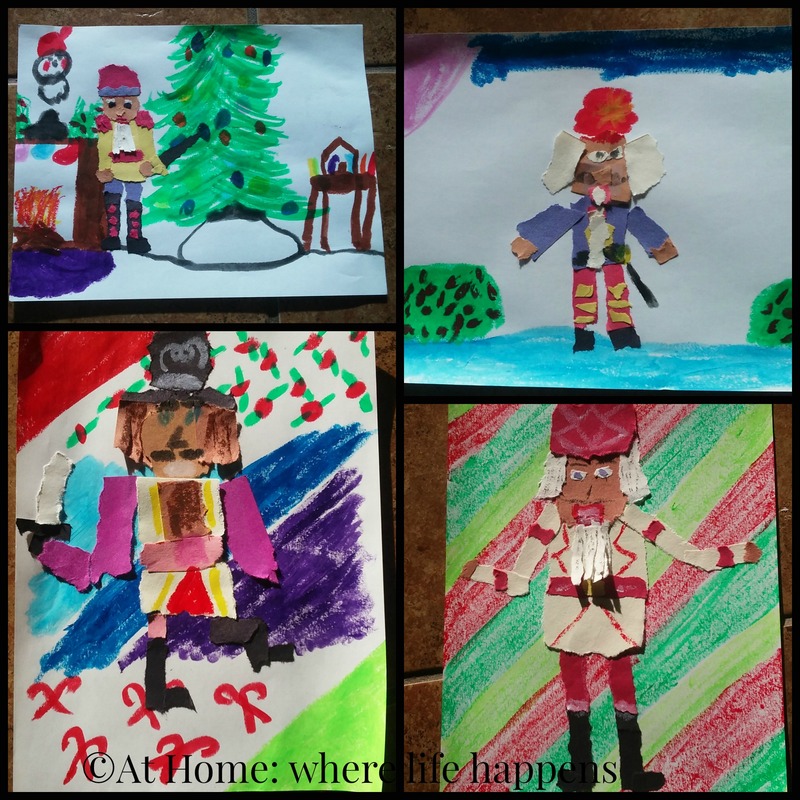 We were making torn paper nutcracker collages and we used the Kwik Stix to create colorful background pages to glue the nutcrackers onto. The bright colors and versatility of the sticks made it pretty easy to create these backgrounds. You can find a video about Kwik Stix on YouTube. I definitely would recommend these to parents of preschool and early elementary aged students. 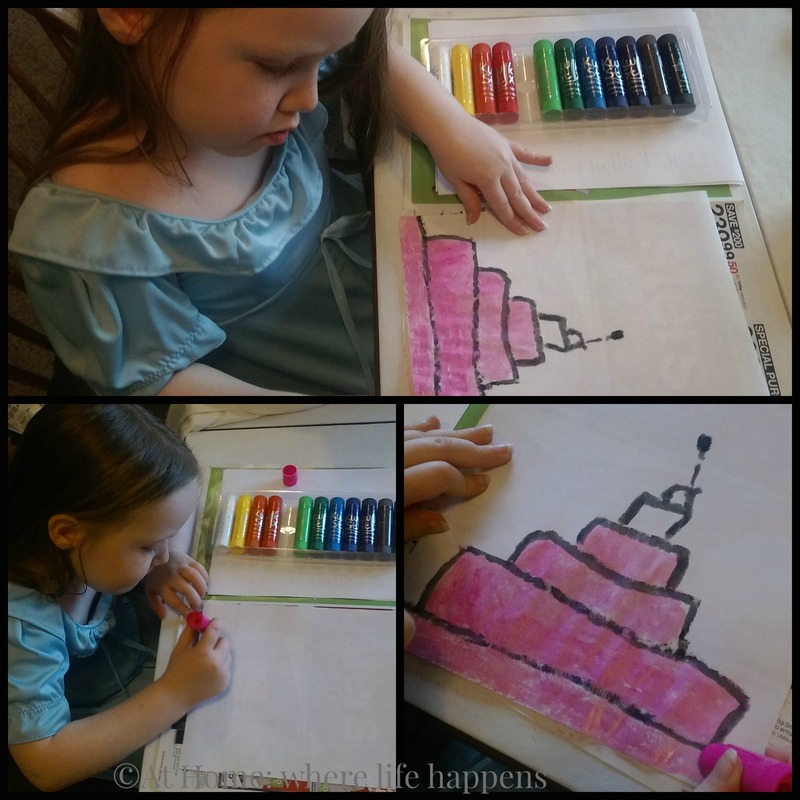 They are fun, easy, and a change of pace for little ones who love art. The Pencil Grip, Inc. will send one winner a set of 6 Kwik Stix. Click below to be taken to the Rafflecopter form to enter. Open to U.S. residents only. Winner must respond within 24 hours of notification or an alternate winner will be chosen. Starts 12/9/2015; ends 12/15/2015 at midnight.